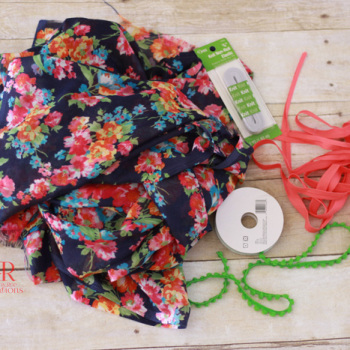 Easy Breezy Swim Coverup Tutorial - Peek-a-Boo Pages - Patterns, Fabric & More! Summer is right around the corner! 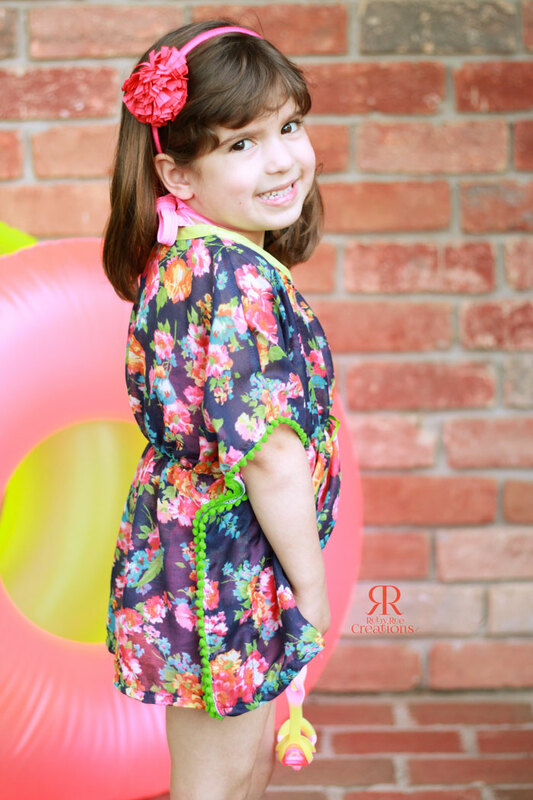 My kids love to swim and I love to make fun swim suits for them. 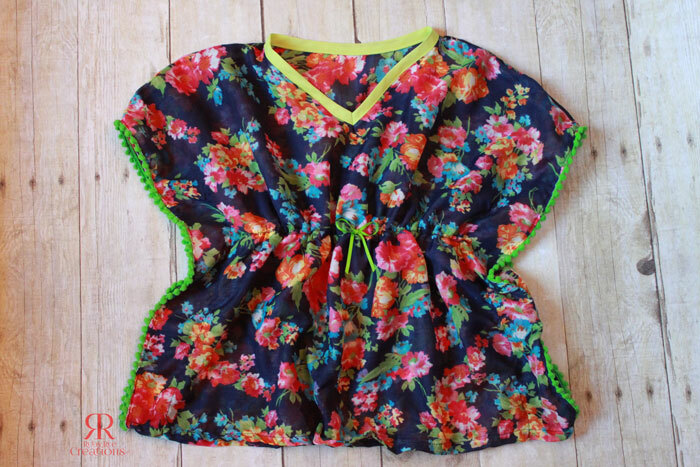 But finding cute coverups that won’t break the bank gets tough! So I decided to make one myself! 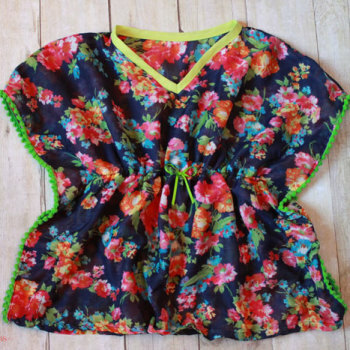 The beauty of this little garment is that she can also wear it as a top with a camisole under it for playing! BONUS!!! I’ll start by saying that making this cover up is not an exact science. 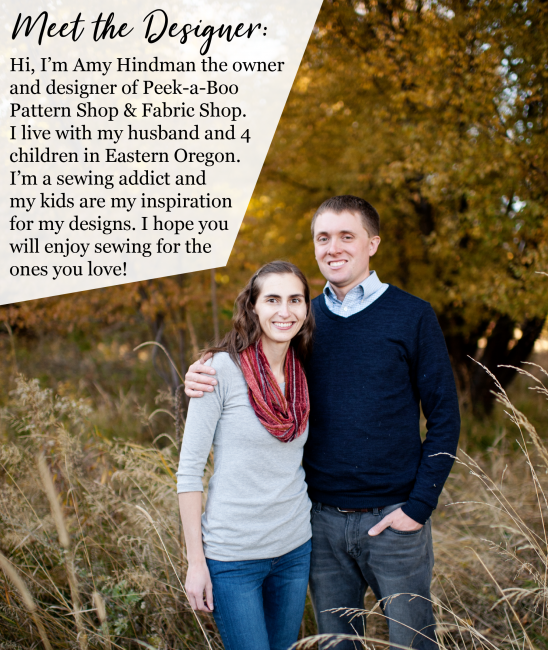 I’ll walk you through how I created this with no pattern pieces and some simple tweaks to a rectangular piece of fabric! 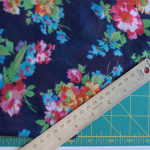 Measurements do not have to be exact, which is why this is so easy!!! Let’s get started! 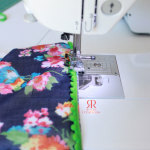 For this project, you’ll need fabric, double fold bias tape, fun trim, 3/8″ non-roll elastic along with the usual sewing supplies (machine, thread, scissors…). 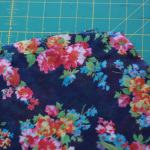 For my fabric, I chose a voile that’s really thin and almost gauze-like. 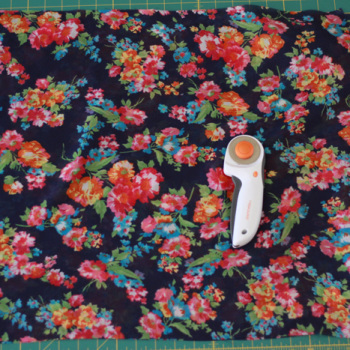 Voile, rayon, double gauze, bubble gauze, or just thin quilting cotton will work great! French terry will also work! I started by cutting two rectangles 21″x24″. I’m making it to fit my almost 5 year old. To get the length I measured from her shoulder to her mid-thigh, which was 21″. You can make it longer or shorter depending on your child. My width was 24″. 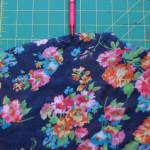 I used the Laguna Beach Swim Coverup as a guide for my neckline. You can use any tee or just wing it! I scooped the back and front slightly first. 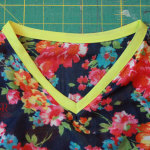 Then on my front panel, I found the center and drew a diagonal line to form the V. Cut along that line for the V neck. I also rounded the top edges down toward the outside (to create the top of the shoulder/sleeve). My pink marking pen shows where I started the slight curve outward towards the edge. 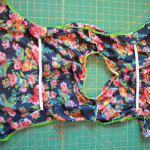 Now with right sides together, sew the front and back panels together at the shoulders. 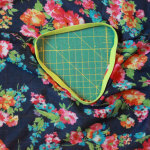 I suggest trying this on your model now to make sure it fits over her head (don’t ask how I figured out to do it now!). To create the point of the V, find the center point of the front. Pinch it about 1/4″ like this on the inside of the coverup and mark it with a marking pen from the tip towards the bottom center. 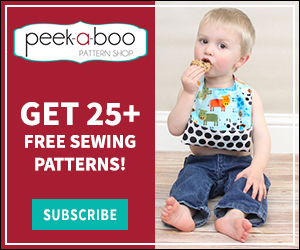 Sew along that mark, making sure to backstitch at both ends. 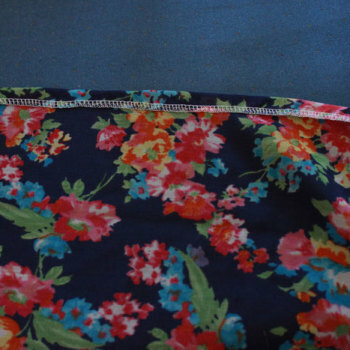 You can see what it will look like on the inside after it’s sewn. Now bring it to your ironing board and press it. Trim time! 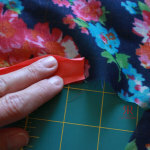 Measure a length of trim that is the length of your sides and cut 2. 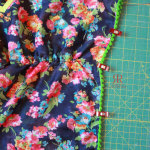 Attatch the trim to the right side of the fabric. I’m using these mini-poms (which are really mini…I rethought those several times!). 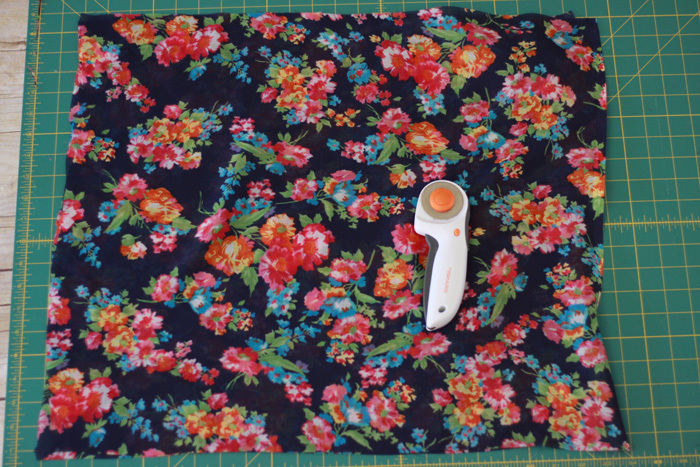 After sewing them to each side, flip the trim to the wrong side and press. 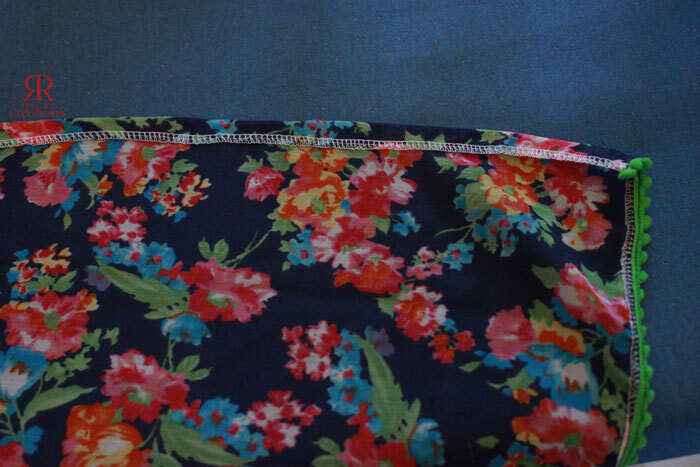 Now topstitch those in place close to the trim. 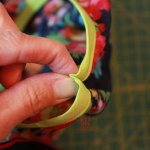 Press the bottom edge up about 1/2″ and topstitch. 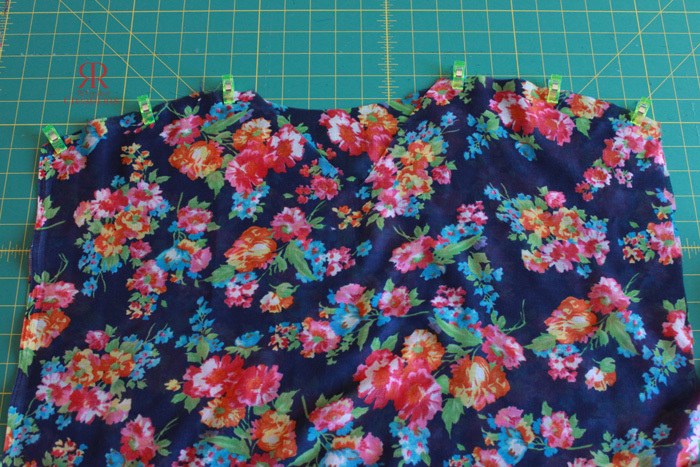 Next we will attach the elastic to the waist. To get this in the right spot, try the coverup on your model and mark her natural waist. 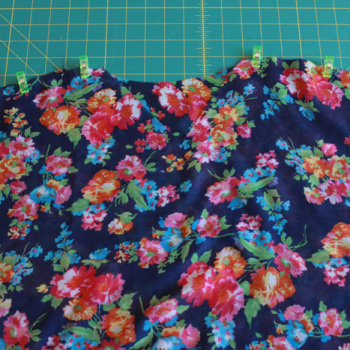 Cut 2 lengths of elastic; mine were each about 9.5″. 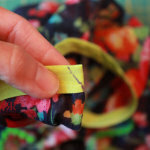 Find the center point on each piece of elastic, as well as the center point of the front and back pieces along the waistline you measured. 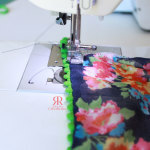 On the wrong side of the fabric, pin the elastic at the center point and then about 2″ in from the outside edge on each side. 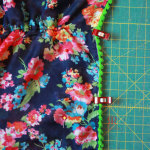 Sew in place with a long zig-zag, stretching the elastic as you go. Do this for both the front and back of the coverup. 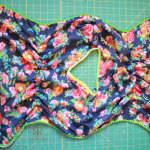 You can attach a decorative bow or twill tape to the front center. This will not be functional. 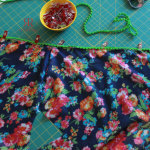 The last step is to create the side seams. 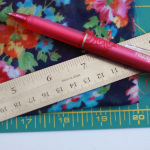 I started about 2″ above the elastic and measured in 2″ from each side and marked a little path with my pins (you can use a marking pencil or tailor’s chalk also). Backstitching several times at the top, I sewed straight down towards the hem. 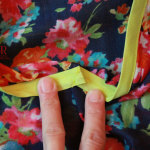 Be sure to catch the elastic edge in this seam to hold things in place nicely. Do this on both sides. Voila! 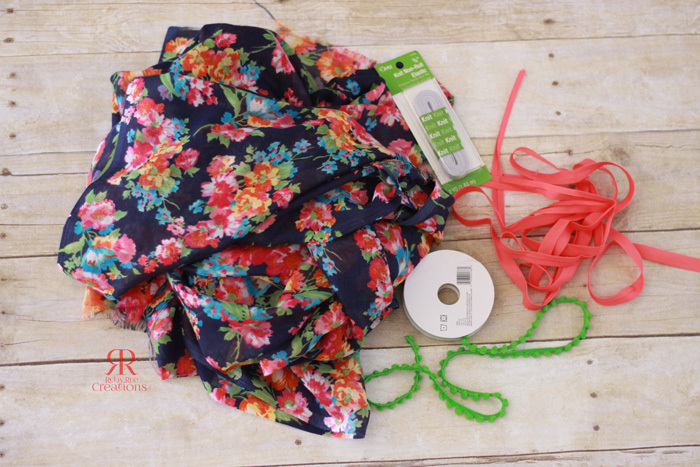 Now you have an easy breezy swim coverup or top that’s perfect for all sorts of Summer fun!